The book consists of 10 chapters which are followed by an Appendix, Bibliography and an Index. A Preface and an Acknowledgement precede the chapters. It is a very well-written compact book on the subject. The author holds a doctorate degree in Chemistry from The Ohio State University and was formerly the General Manager of the New Ventures Technology Division of Exxon Chemical Company. He has more than 100 patents to his credit and has written two books (US Petrochemicals: Technologies, Markets & Economics and Trends in Petrochemical Technology: The Impact of the Energy Crisis) and nearly one hundred papers and articles. Therefore the reviewer feels that there could not have been more competent person to author a book on this important subject. With the reserves of natural gas and crude oil declining and global warming on increase the emphasis on development and use of biofuels grew leading to US legislation in 2005 and consequently the Renewable Fuel Standard (RFS)-the basis for which was the Energy Policy Act of 2005 and among other tax incentives provided loan guarantees. This was followed by Energy Independence and Security Act (EISA) of 2007, which set the domestic biofuel target to 36 billion gallons by 2022. This resulted in laying emphasis on corn starch fermentation process to produce Ethanol with the result that its production increased to 14 billion gallons and this diverted 40% of corn production to produce ethanol. Brazil had achieved success in producing ethanol through sugar cane fermentation. In. order to contain rise in corn and food prices, use of cellulose waste material was recommended to produce ethanol. There are efforts to produce Isobutanol instead on ethanol, and this has several advantages since the synthesis gas based processes that are used to produce Isobutanol can also produce diesel which are both renewable motor fuels. In fact some US companies feel that biodiesel may surpass gasoline as primary motor fuel by 2020 and it is expected that Isobutanol and diesel may surpass all renewable fuels by 2022. Natural gas provides another alternative as motor fuel and it is expected that heavy duty vehicles may and passengers’ cars may use natural gas as fuel. Electric vehicles using battery or fuel cells may also be used. In fact electric automobile was used for powering a vehicle in early twentieth century and was abandoned and recently rediscovered. Similarly diesel was introduced in the nineteenth century, abandoned and later rediscovered. Coal liquefaction was considered as serious alternative for motor fuel but abandoned in early 1980. 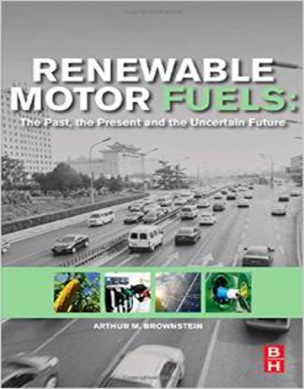 The book will provide in depth information on the subject and makes an interesting reading for those wanting to look into past, present and future of motor fuels and several alternatives that can be explored.